Therefore, as Godâ€™s chosen people, holy and dearly loved, clothe yourselves with compassion, kindness, humility, gentleness and patience. Bear with each other and forgive one another if any of you has a grievance against someone. Forgive as the Lord forgave you. And over all these virtues put on love, which binds them all together in perfect unity. Let the peace of Christ rule in your hearts, since as members of one body you were called to peace. And be thankful. Let the message of Christ dwell among you richly as you teach and admonish one another with all wisdom through psalms, hymns, and songs from the Spirit, singing to God with gratitude in your hearts. And whatever you do, whether in word or deed, do it all in the name of the Lord Jesus, giving thanks to God the Father through him. In his sermon, Patrick read verses from Colossians and Ephesians, but his message sounded and felt like more of a history lecture on social justice rather than a sermon in a mainline church. 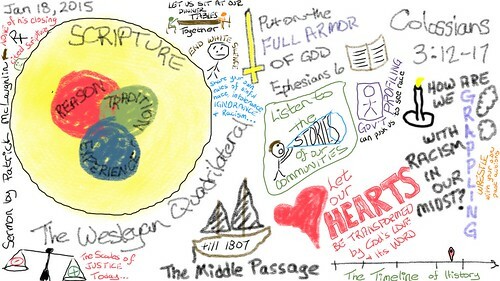 In the sketchnotes, I inserted the words “Let our hearts be transformed by God’s Love and His Word.” Patrick emphasized the importance of us loving each other, and put the focus of action on what WE as human beings could and can do. This made his message strike me as somewhat Gnostic, since it did not emphasize our need for Christ and the idea that WE cannot do anything (including change race relations in our communities and culture) without God’s power and actions. I think this was the first time I’ve heard a pastor give a personal, racism-based “confession” during a sermon, and I think there was value in this. It took courage for him to admit mistakes he had made as a youth, which particularly focused on using the “N word.” I totally agree that we need to be having dialog within our churches and our communities about how we can constructively move forward with improving race relations. Patrick’s suggestions about “listening to the stories of others in our communities” and “sitting down at the table to eat together” particularly resonated with me. As a Storychaser, I especially agree with the first one, but the second one is an important strategy I don’t think we discuss or utilize nearly enough to promote understanding and the overall strengthening of relationships. I added this to my Flickr set for visual notes / sketchnotes. I was visiting FUMC in Manhattan, Kansas, today with my parents. I’m a member and elder at First Presbyterian Church of Edmond, Oklahoma.